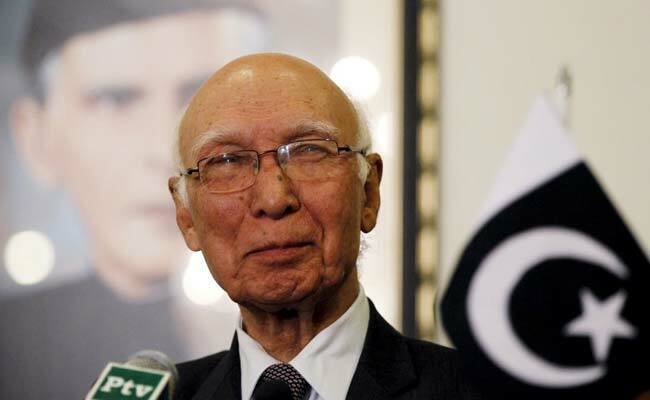 File photo of Sartaj Aziz. Islamabad: For the second time within a week, Pakistan on Tuesday offered India a bilateral arrangement for not conducting a nuclear test, saying it will send a positive signal to the Nuclear Suppliers Group (NSG) where both the countries have applied for membership. Foreign Office spokesperson Nafees Zakaria today said that following the nuclear tests in 1998, Pakistan had proposed to India simultaneous adherence to the Comprehensive Test Ban Treaty (CTBT) but the proposal did not elicit a favourable response from India. "Once again, in the larger interest of peace and stability in the region, as also in the global context, Pakistan has indicated the possibility that the two countries may consider a bilateral arrangement, which is reflective of its policy of promoting restraint and responsibility in South Asia and its consistent support for the objectives of the CTBT," he said. "The bilateral non-testing arrangement, if mutually agreed, could become binding immediately without waiting for the entry into force of the CTBT at the international level," the spokesperson added. He said while the unilateral moratoriums declared by the two countries were voluntary, legally non-binding and could be withdrawn unilaterally, a bilateral arrangement will be mutually binding and difficult to withdraw from unilaterally. Both countries could consider working out the details of the arrangement and mutually agreed confidence-building measures in relation to it. It could set the tone for further mutually agreed measures on restraint and avoidance of arms race in South Asia. He said a bilateral arrangement on non-testing will also send a positive signal to the Nuclear Supplier Group (NSG) countries which are discussing the non-proliferation commitments of non-NPT states in relation to the question of membership. Earlier, Mr Aziz had said that Pakistan is prepared to consider translating its unilateral moratorium into a bilateral arrangement on non-testing with India. He had added that Pakistan is confident of the merits of its membership application as its export controls were harmonised with those of the Nuclear Suppliers Group (NSG), Missile Technology Control Regime (MTCR) and Australia Group.